The last two weeks of action hasn’t just put the Sabres in a better position to contend in the Eastern Conference this season, Tim Murray’s moves have also made his potential expansion moves more obvious. Entering the offseason the likelihood of Murray adding at least one significant body at forward and perhaps another on the blueline made handicapping Buffalo’s expansion options difficult. There were too many holes and too many question marks to nail down throughout the summer. Now that Kyle Okposo and Dmitri Kulikov are officially Sabres, pinning down exactly who Tim Murray will protect is a little bit easier. Vegas’ selections will become official on June 21 of next summer although with their choices being made on the 20th you can probably count on hearing a few leaks ahead of time. The rules have found their way into the public’s hands as the process progressed and if you aren’t already familiar with the NHL Expansion Draft rules, you can find them here. For the most part, the Sabres are in a very advantageous position heading into next summer’s expansion draft. The exemption of first and second year pros means the likes of Jack Eichel and Sam Reinhart won’t need to be exposed. This concession actually rules out over a half-dozen forwards who are under contract with the Sabres moving forward, a significant number which provides flexibility when it comes to the players who will be eligible to be selected. Buffalo is likely to run into some trouble in net as the league is requiring all teams to expose a goaltender who is either under contract or a tendered RFA. Robin Lehner will almost certainly be protected by the Sabres and it’s my understanding that Linus Ullmark will be considered exempt. Of note on Ullmark, he has technically played two professional seasons but one was overseas and Bill Daly noted at one point that pro experience would only apply to North American play. So under than definition he should remain exempt. With Lehner set to be protected and Ullmark potentially exempt, that only leaves Anders Nillson (Jason Kasdorf will be exempt too) to be exposed. However, Nilsson is a pending UFA and unless the Sabres extend him, he wouldn’t count. So there is some work to be done in goal ahead of the expansion draft. Luckily the NHL’s exemption rules leave many of the Sabres’ most valuable players safe from the draft. That compounds matters as it leaves more slots for Murray to fill without needing to worry about the likes of Eichel, Reinhart or others. In my mind, Buffalo’s best course of action is to protect eight skaters as opposed to seven forwards and three defensemen. My thought process is specifically motivated by Buffalo’s newly placed focus on strengthening their blueline. To only have three players protected from that unit could potentially unravel a lot of the work that has been done in recent weeks and months. There are certainly enough forwards on Buffalo’s roster worth protecting if you go the seven forward route. However, when you get beyond the big names like O’Reilly and Okposo, the balance between keeping a couple of extra forwards and keeping the blueline intact tips in favor of the defense. One piece of the strategy I am considering moving forward is the fact that it seems advantageous for the Sabres to extend and protect Dmitri Kulikov. That likely isn’t a popular opinion or one that makes much sense given that handing him an extension basically pigeon holes the team into protecting him come draft time. I realize that Kulikov will be a pending unrestricted free agent next summer. Buffalo can simply leave him unprotected given the highly unlikely situation that Vegas selects a player nine days from free agency. 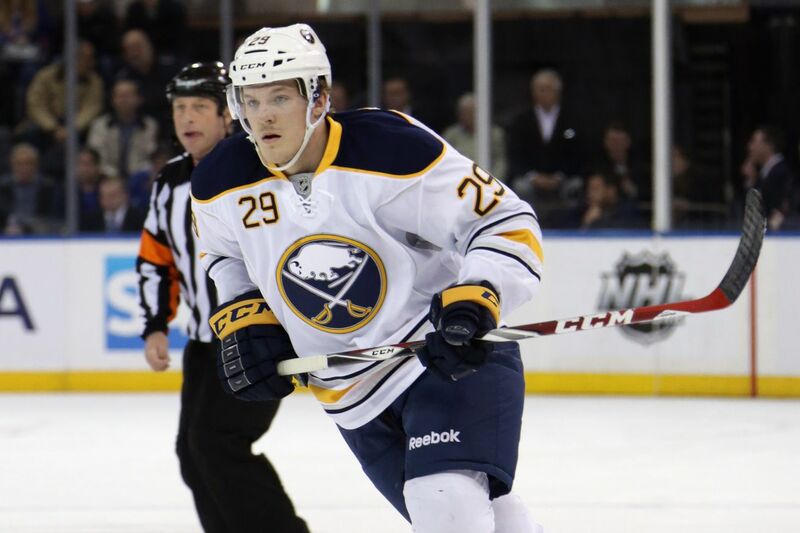 The Sabres can then re-sign him prior to the opening of free agency and all will be well. The only issue there is that the Sabres would still be left with the same nine-day window in which to get a deal done. Yes, the Sabres could reach some sort of handshake agreement with Kulikov ahead of the draft and just not sign the deal until the 22nd, but is that a risk you’d be willing to take? Not only would it put Murray and the Sabres in a poor negotiating position, you’re still pushing the timeline to within a week of free agency opening and within days of the negotiating window opening. It seems like an unnecessary gamble to me. Leaving that work to the final days or hours until the negotiating period leaves too much room for other teams to step in and make a pitch before the Sabres lock Kulikov up. My second thought on locking up Kulikov early is that he’s set to be a vital asset to the team this year. An asset Tim Murray went out of his way to get. 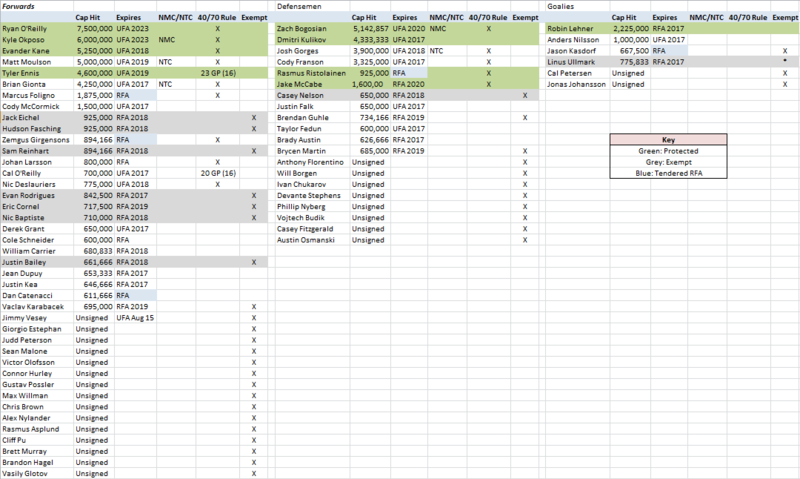 While the Sabres are certainly on the upswing, they’re hardly in a position to be acquiring rental players and letting them walk away the following offseason. The trade for Kuilkov, as it stands now, was quite even in my opinion. If Kuilkov isn’t re-signed after next season, that trade will be very ugly from a Sabres perspective. To think that you would want to gamble on Kulikov’s contract status doesn’t add up for me. Simply put, it’s bad business from a hockey perspective. With that being considered, the eight players I’d keep for the Sabres are Rasmus Ristolainen, Zach Bogosian, Kulikov, Jake McCabe, Ryan O’Reilly, Kyle Okposo, Evander Kane, Tyler Ennis and Robin Lehner. It’s all very straightforward, especially working under the assumption that Kulikov will be extended. There are a few scenarios in which names could change, but as it stands today I think that would be a fairly safe bet. Of the potential switches, perhaps the least likely would be a situation in which the Sabres asked Zach Bogosian to waive his no movement clause. I can’t envision a scenario in which that would occur, but as a nuclear option, it would be on the table. Perhaps a more realistic change would be removing Evander Kane in exchange for another one of Buffalo’s forwards. Kane’s age and talent are incredible assets for any team. However, his off-ice demeanor in Buffalo has drawn a lot of negative attention and if Tim Murray decided he wanted to get out from under the headache, exposing him in the expansion draft would be one way to do so. Of course, there’s a good chance Vegas would pass on him in favor of a different Sabre for the very reasons Buffalo would be exposing him. If that’s the case, it would almost be like inheriting a bonus spot. Assuming Kane wouldn’t be picked regardless of being protected or not, Murray could leave him available knowing full well he wouldn’t be losing his young power forward. There’s a risk-reward proposition there, but if he isn’t picked you retain another offensive weapon without using a protected slot and if he is picked, you’re at least ridding yourself of any future off-ice headaches. Including Ennis on my list was more a choice of convenience than anything else. He had a down season last year and if he doesn’t find his stride this year then he’d obviously be replaced by a more deserving candidate. Ennis seems to fit in a category with Girgensons and Larsson as effective players who would easily be protected under the 7-3-1 format. However, when weighing their value against the core of the blueline, the blueline wins out. Ultimately my logic was based on which area is more valuable to the Sabres down the road. There will be pain when a player is selected no matter what. However, would be more painful to watch Jake McCabe suit up for Vegas or see the Kulikov trade become just Pysyk, a second and third for Rasmus Asplun? Or is it more painful to lose Johan Larsson, Marcus Foligno or Zemgus Girgensons?